Everybody who visits Nepal always hears about the legendary region and so we have modified and present you a very special itinerary for exploring the hidden valley and be off the beaten track. This trek provides the ultimate challenge of high passes like Masokanto La (5099m), Kangla pass (5200m) & Tilicho Pass (5230m). And you will get to see the beautiful Lake Tilicho. The destination of this trek is the Nar-Phu valley, above the tree line still, there is natural cultivation, in the very northern parts of Manang district. It takes five wonderful hours reaching the pass that links Nar with Manang and the three Bhotia villages in the Nyershang down the valley. What is special about Nar Phu is that the 300 inhabitants all depend on livestock, in contrary to the most Bhotia people, who are more trading people. It is the result of the closure of the borders with Tibet. This itinerary, therefore, is very alternative, just a few foreigners have visited the area and tourism infrastructure is almost non-existent. Only recently the Annapurna Conservation Area Project (ACAP) reached out for Nar and Phu Valley, and now a suitable tourism development plan is undertaken to this undiscovered valley. Nar Phu valley is listed in a restricted area so we need to have a special trekking permit for the Nar Phu. The trek starts after a day’s ride from Kathmandu to Besishar. From here we follow the popular Annapurna Circuit route until Koto and then the real adventure starts by leaving the beaten route until we get to Nar Phu. After breakfast we will start for sightseeing tours around in Kathmandu valley, the sightseeing program is focused to introduce some highlights and UNESCO World Heritage sites of Kathmandu such as Durbar Square, Swoyambhunath, Pashupatinath, and Bouddhanath. This day after breakfast we take a drive to Dharapani. After breakfast, we start through a narrow field from the village, the Dudh Khola, which originates from the south face of Manaslu, enters on the opposite bank. The Marshyangdi then veers to the left, and as Annapurna II becomes visible ahead, we arrive at Bagarchhap, a Bhotia village with prayer flags fluttering in the breeze. Continuing to climb through forests of pine and oak, we pass through Dhanakyu before coming to a thundering waterfall. Further on, the Marshyangdi Khola enters a gorge and the path consists of steep stone steps. Pausing for breath, we can look back for views of Manaslu. When the steep incline ends we follow a path amid magnificent rhododendrons to Ratamron and then continue on a gently rising path, crossing a stream before entering a pine forest. We then cut across a loose hillside to the hamlet of Koto. This day after breakfast, we trek on small jungle paths, which is quite a change from the bigger trail around Annapurna. The first part is up and down and then we have a short steep ascent to Choto, We then have lots of steep ups and downs and the path is quite exposed above the Nar Phu Khola, then we cross a suspension bridge, here the valley is very narrow and just before the bridge there are some hot springs. The rock-carved path now becomes very exciting, both because of danger, but also because there are some big waterfalls. This day after breakfast, we begin the day by crossing Methang Khola river and then start a breathtaking climb on a winding path to the Methang pastures. Here at Methang there is an ancient Chorten and marvelous views of Kang Guru. Further on we pass the abandoned Methang village, from the village there is a path to Kang Guru BC. The path to the next village Junan is easy and flat. This day our trek begins with a hard steep ascent to the abandoned Kyan village, where there is a nice long main wall. We continue on an amazing tunnel carved rocky path 70 meters above the river and then decent to the riverbed, then we follow the riverbed and pass some Mani Chrotens. Then climb up from the riverbed to the Phu valley entrance door (Phuohi Yalgoe). About an hour from the valley entrance we cross the Phu Khola and begin climbing up to the village. Phu village consists of about 30 houses, which are home to 150-200 people. This day is easy day, exploring a little further up in the valley, visit a monastery. After breakfast, we start trek to get to Naar, we have to go back down the valley, we pass Chaku and walk on for a couple of hours before we cross the Phu Khola at Naar Phedi (two bridges to Naar). From here we climb up to a very nice grassy to Naar. This day our trek begin with steep climb couple of hours to Naar Village (4110m), we have lunch here near the village, so we can take a look at it before we walk on. We continue on a long but gentle ascent through the lateral moraine of Temdenzon Khola, on a nice path at the bottom of Kang La. This day we have a long and hard day ahead of us, however, it is very rewarding. We have to cross the big Kang La pass (5280m). It is a very steep ascent to the top of the pass where there are a chortens and some great views of the Annapurna massif. Just before reaching the pass, there is a small lake where we take a rest before making the last effort to reach the top. From the top of the pass it is a very steep descent, but after an hour we take a grassy path that leads to Ngawal. After trekking for more than an hour, the trail faces a valley and then we encounter a stone hut surrounded by apple trees. We are now bestowed with a stunning view up the side valley; the trail further steepens and winds through a small meadow. On the way, we come across goat and yak pastures. The trail to the Tilicho Starts up a side valley then traverses onto a moraine, making a long climb to 4710m. There is outstanding view of Tarkeghyang, Gangapurna and the Khangsar Kang. Tilicho Lake, the highest lake in the world, presents a particularly dramatic spectacle. Sometimes its turquoise water reflects the surrounding peaks but more often its frozen solid. After spending the memorable time at Tilicho Lake, we will trek down to Tilicho base camp via the same way. The trail continues to climb out of the Marsyangdi Valley. The trail follows this valley north, passing a Goths as it steadily gains elevation. You have left the large trees below; the vegetation now consists of scrub juniper and alpine grasses. 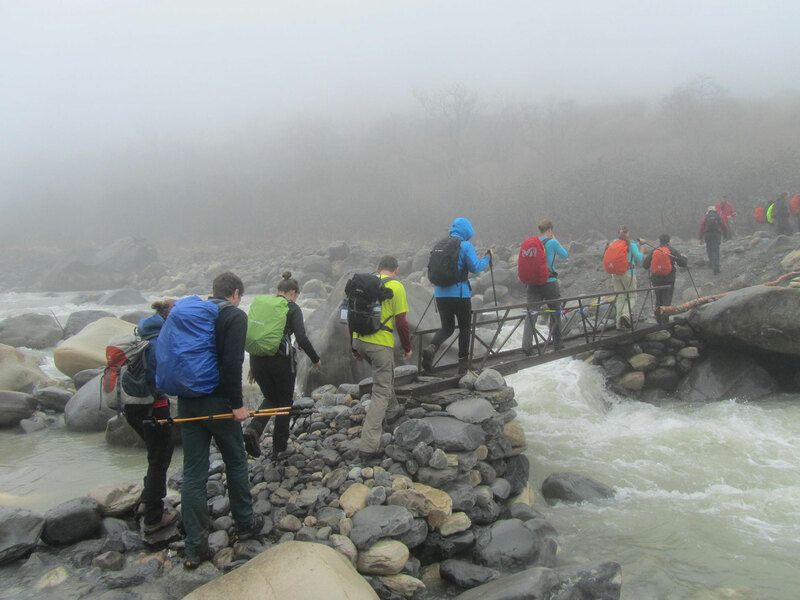 you can keep high and follow a track above Khangsar village passing through the ruins of old Khangsar and follow an unmarked trail which will lead you around and down to cross the river on an old log bridge between Gunsang and Yak Kharka. It's fun to see large yaks grazing at Yak Kharka. The view of Annapurna III is excellent. This day after a short ascent up the mountain path on the right bank, you follow a narrow trail across an unstable scree slope and then descend to Thorung Phedi. This day we start early for our crossing of Throng-La (5416m). The trail becomes steep immediately on leaving camp but as this trail has been used by local people for hundreds of years the path is well defined. The gradient then eases and after about 4 hours of steady climbing, you reach the Chorten and prayer flags of the pass. The views are dramatic, to say the least, from the snow-covered mountains above to the head of the Kali Gandaki valley below and the brown and purple hills of Mustang which are spread out before you. The descent to Muktinath is a knee pounding 1600m but it’s compensated for with excellent views of Dhaulagiri. Eventually, the moraines give way to grassy slopes before a pleasant trek along the Jhong Khola Valley to Muktinath and its shrines and temple. This day after breakfast we start the trek with some shining downhill, which will be more pleasurable with jeep tracks trails with a mostly downhill gradient! We have to start early as the wind gets up after 11am making riding a bit more challenging. Chill out this section and enjoy the views of many different mountain ranges. Morning after breakfast, we take a spectacular early morning flight along the Kali Gandaki gorge to Pokhara and in afternoon sightseeing around in Pokhara, visit, waterfall, Vindevasini temple, and cave. From Pokhara the tourist buss leave early morning to Kathmandu. It takes 6 hours from Pokhara to Kathmandu and if we take a flight it takes 30 minute.